Designed specifically for the demanding needs of post production professionals, RX 7 Advanced continues to be the industry standard audio repair tool used on movies and TV shows to restore damaged, noisy audio to pristine condition. 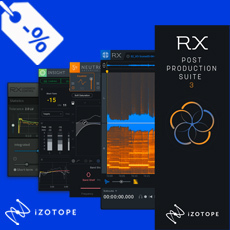 Trusted by the top audio pros around the world, RX 7 continues to lead advances in audio signal processing and machine learning that were once unimaginable. Dialogue Contour - Using Dialogue Contour, you can reshape the intonation of dialogue to rescue or improve a performance in post production. Dialogue Contour features pitch correction processing that is tailored to speech and designed to adjust the inflection of words within a phrase of dialogue that may not match or flow correctly with the rest of the dialogue in the clip. Dialogue De-reverb - Reduce or remove unwanted reverb from dialogue clips using an algorithm trained with machine learning and optimized to separate spoken dialogue from reverberant signal content. Rescue production audio with too much reverb to avoid ADR and save money. Multichannel Support - Tackle audio issues that appear in any or every surround channel effortlessly up to Dolby Atmos 7.1.2. Repair Assistant - Repair Assistant - Representing the latest advances in iZotope's assistive audio technology, Repair Assistant is a game-changing intelligent repair tool that can detect noise, clipping, clicks, and more. De-rustle - Developed with machine learning, De-rustle enables you to remove lavalier mic rustle from dialogue with a single click—an industry first! Dialogue Isolate - Developed with machine learning, Dialogue Isolate extracts dialogue from noisy environments with complex background sounds like clanging plates in a restaurant, traffic noise, and machinery. De-wind - Clean up intermittent low frequency wind rumble from location dialogue. Composite View - Edit multiple files at once to fix problems picked up by multiple microphones or in multichannel files. Mouth De-click - Remove distracting mouth noise with the low latency Mouth De-click. Spectral De-ess - Tame overly aggressive sibilance. The Spectral De-ess mode transparently attenuates sibilance with iZotope’s Spectral Shaping technology. De-bleed - Fix bleed problems in multi-mic’d situations, click track bleed, and other bleed issues. Ambience Match - Fill in consistent ambience beds under constructed sentences and ADR lines right from within Pro Tools AudioSuite. EQ Match - Impart the EQ profile of location dialogue to ADR with two clicks. Spectral Repair - Visually paint away unwanted audio like ringing cell phones, birds, and scene-interrupting sirens. Voice De-noise - Fine-tuned for vocals and dialogue, reduce unwanted steady state or changing background noise like air conditioning, refrigerator hum, and amp hiss. Breath Control - Reduce or remove distracting breaths between words and phrases. De-click - Clean up vinyl clicks, clocking errors, and more with the low-latency De-click algorithm.